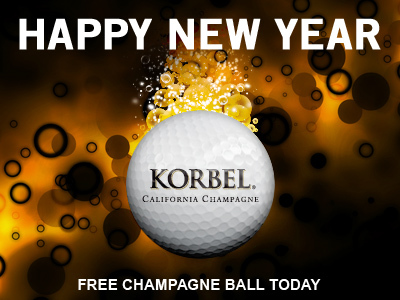 Pop the bubbly with a Champagne Vapor Ball -- yours free just for logging in to WGT today, 12/31. *Special offer for WGT players who log in and play WGT on 12/31/15, receive one free WGT Champagne Vapor virtual golf ball. The popular Gold MAX virtual golf balls are back – but only until tomorrow! 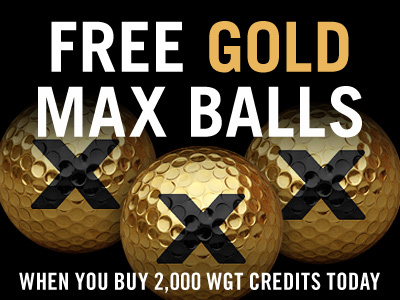 Get some holiday relief with 3 free Gold MAX Slow Meter Vapor virtual golf balls, when you buy 2,000 or more WGT Credits. *Special one-time offer for players that buy 2,000 or more WGT Credits 12/29/15-12/30/15, get 3 free MAX Slow Meter Gold Vapor virtual golf balls (Hack+ or Pro+) on a single purchase. 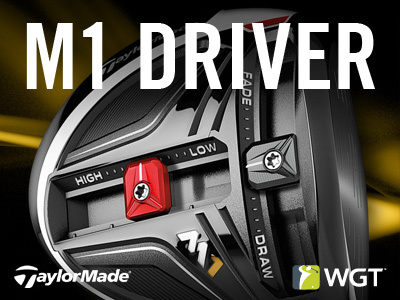 Get more distance and overall performance off the tee with the new TaylorMade M1 Driver on WGT. The newest from TaylorMade gives you extra distance, more precision and forgiveness to improve your virtual golf game and lower your scores. 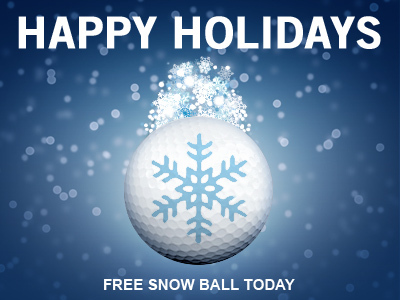 As a holiday gift to you, we're giving you a free Snow vapor ball when you play WGT today, 12/25. The Snow Vapor virtual golf ball is not only a player favorite (in the winter and otherwise!) but gives you extra distance and durability on your shots, plus a snowy vapor trail to add some chill fun to your game. These also make great gifts for your WGT friends, just click GIFT in the Pro Shop to share the love! 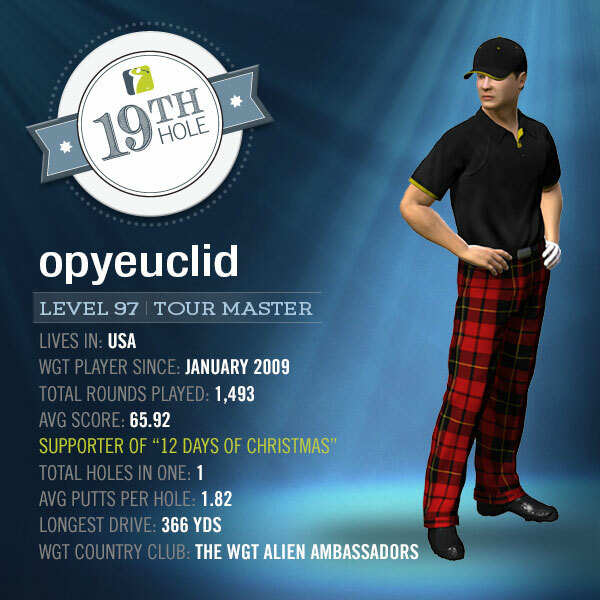 *Special offer for WGT players who log in and play WGT on 12/25/15, receive one free WGT Snow Vapor virtual golf ball. Get the new TaylorMade M1 Driver on WGT to add more distance and overall performance off the tee. Find yourself coming up short on shots in the game? Try the M1 virtual driver to get the extra distance you need, plus more precision and forgiveness. 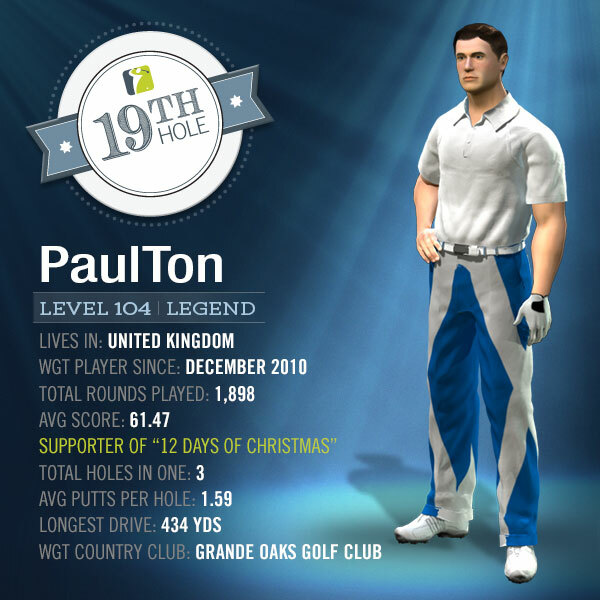 The annual 12 Days of Christmas is a community event where WGT players volunteer to be "Santas" to give away all kinds of free gifts on WGT to other players. The event is organized by mrcaddie and his friends, to keep it running smoothly year after year. This year is the fourth annual, with no signs of slowing down! 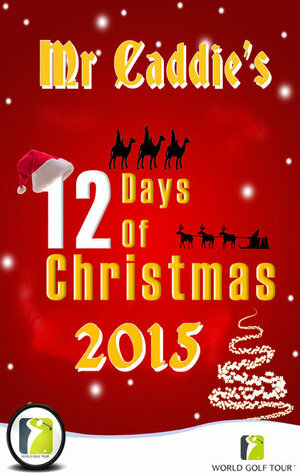 "What is it that makes you want to take part in mrcaddie’s 12 Days of Christmas?" "Merry Christmas and a Happy New Year to everyone out there in WGT land! Christmas is a time for families and friends to come together and a time for giving gifts to those who maybe can't afford to buy for themselves. And it’s no different in WGT land. My CC, Grande Oaks Golf Club, is my immediate virtual family, my friends list is my extended family and the wider communities are my friends. Organized and led by the one and only Mr.Caddie, who began this 4 years ago and now his “12 Days of Christmas Giveaway” is a WGT tradition. The gifts could be anything from a Putter Pal right up to a full set of clubs and anything in between! My own contribution will be to offer artwork to anyone who wants some - this could be a customized player picture or logos and/or banners for your CC." *Event poster above, designed by PaulTon. "I've known Mr. Caddie for a few years now and when he started the '12 days of Christmas,' I thought it was a great idea of his to be able to help other WGT members who could use some help. After my first season participating and seeing the kindness from all who participated, and also from others in the background, with the laughter and gratitude and everyone having fun at a special time of year, makes helping out very rewarding. It's been a pleasure participating and I look forward to many more years. Morningside Hills CC is pleased to join me this year of being Santa. Christmas to me is about family and friends, with the warmth and kindness you feel and see, which I’ve found that the community of WGT is also a part of." The giveaway that Mr. Caddie started when I was a younger Forum Troll and not so unreformed looked like a snowball's chance in Bla Bla Bla, but the community got together and started something! It is more about friends we may never meet face-to-face, but still enjoy what the game of golf is all about. A good or a bad day at the course, when old and new friends have a game, the score does not matter because we all win." "I, like a lot of members, were already gifting randomly and when Caddie came up with the Giveaway idea, it seemed a natural progression... For me it was about being part of a community and building a better Forum spirit. Also - I remembered how much more enjoyment I got while learning the game in the beginning. With the better clubs and balls, they actually went where I envisioned it in my head, so it was about trying to pass that on to members who maybe couldn't earn credits or didn't want to invest in the game before trying new clubs/balls etc. I know members who were recipients of gifts, then passing it along. In fact the irons I'm using now were sent to me completely 'out of the blue' by a member I had sent a gift to, two years before! WGT has many generous members; it took someone like Caddie who put in much time and effort, to make the Giveaways the success they have been." The 12 Days of Christmas is a fabulous goodwill gesture and inspired idea by our good friend MR C. From what I've seen from previous years it gives a boost to players who want to upgrade equipment or play with decent balls but don't have the funds to do it. It's always nice as well for players with some extra change to know they've helped out a fellow player. I hope to see you all in the "And Everything Else" section of the main forum…should be fun as always!" "Aussie Aussie Aussie! is my country club though I rarely call it that. It is 'our' club. Mr. Caddie's '12 Days of Giveaways' is just how an Aussie embraces mateship and helping a bloke out. We actually really love to give things out whether small or large and having the recipient being so appreciative always gives us a buzz and a reason to have a beer and cheer. 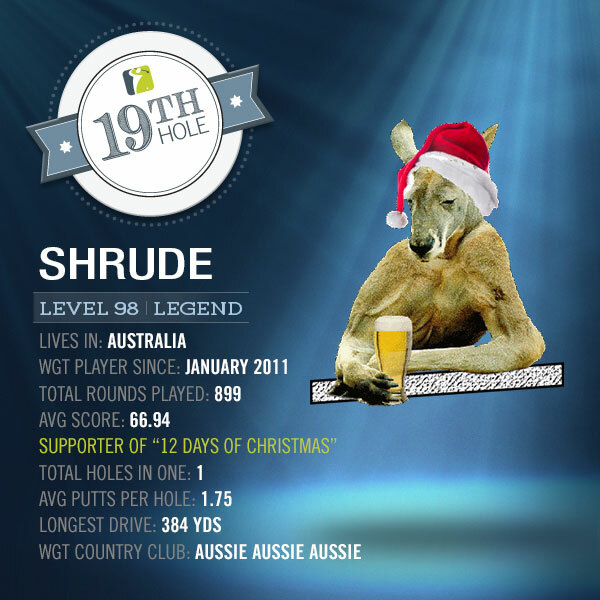 The discussion on our forum is very active as we watch other clubs during the 12 days, and we are also proud to say we have Mr Caddie as an Honorary Member of Aussie Aussie Aussie!" Thank you to PaulTron, PatriciaWilliams, opyeuclid, alcaucin, Lobsterboy, SHRUDE, mrcaddie and ALL the "Santas" involved with the "12 Days" over the years, we love the reminder to share the love! mrcaddie’s 12 Days of Christmas started Sunday, so be sure to check the "And Everything Else" section of the Forum to join the fun and hopefully be chosen by one of these generous “Santas.” This thread is a great place to start! 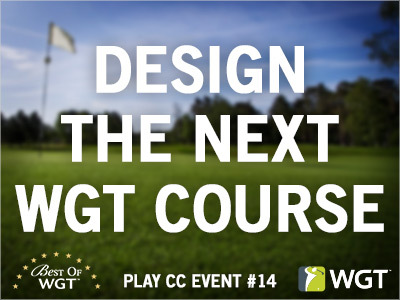 Want to design the next WGT course? As a holiday gift to our players, we're giving the top three WGT Country Clubs in CC Event #14 the chance to design three new "Best Of" courses for 2016 (Best of Par 3, Best of Par 4 and Best of Par 5). Your club will be named as the course designer and WGT players everywhere will get to experience your masterpiece. 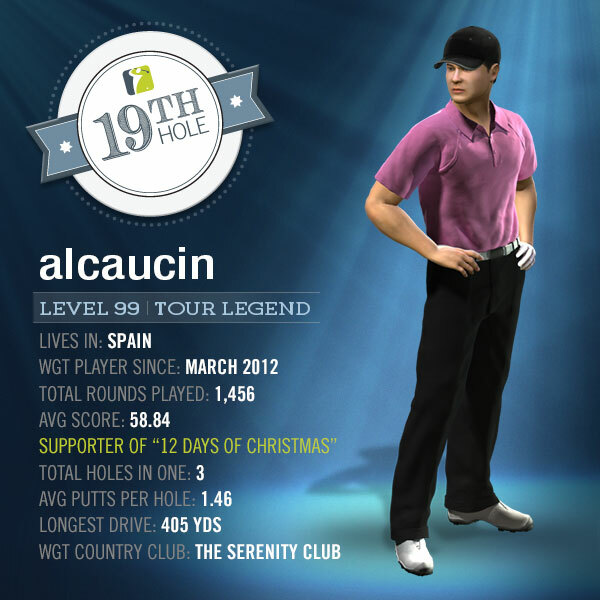 So rally your club now to compete today and tomorrow for your chance to make WGT history. Play today and tomorrow to compete against other country clubs for club pride, gift tees and flags and additionally to this event, the top 3 country clubs will design one of the three Best of par courses on WGT. Each Event is made up of Club Clashes that last for a limited amount of time (usually a few hours). When your club enters the event, you'll get matched with another club close to your skill level, and a timer will show how much time is left in that Clash. Club members from both clubs can play as many rounds as they want during that time, using Club Passes and Super-passes to earn points. frappefort - The Hard Hitter! 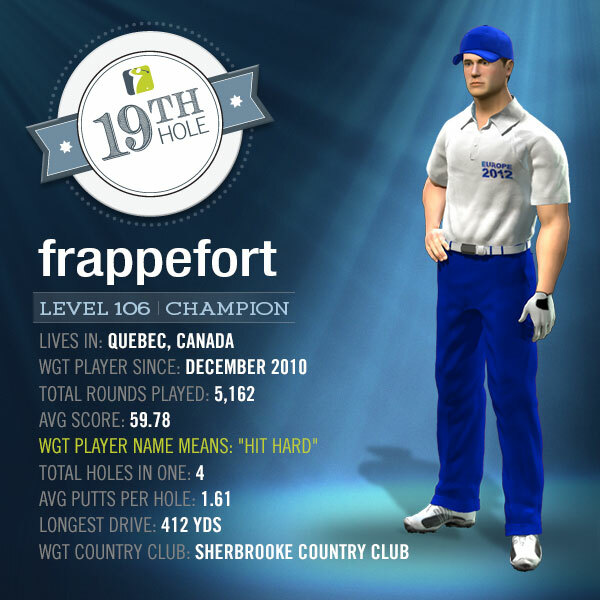 This WGT 19th Hole selection was a suggestion from well-known WGTer YancyCan, who described frappefort as "one of the most sincere gentlemen there is on WGT." He also tells us that frappefort lives by the motto: "pour le plaisir," which translates to: "fun only!" ...and that's a motto we can get behind! frappefort (also known as Francois, outside of WGT) is from Quebec, Canada and says, "I may be 64, but feel like an old hippie, not knowing he is growing old." He discovered WGT in 2010 after a work accident prevented him from playing golf any longer. 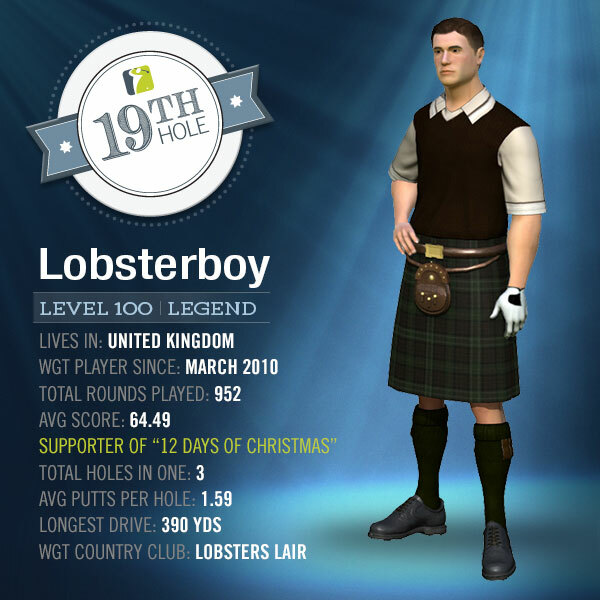 After an Internet search for an online golf game, he found WGT and has been here ever since! Quick fun fact(s): his unique player name "frappefort" translates to "hit hard," though he originally was hoping to make his player name, "Fab." As his motto suggests, he loves to have fun and says that he's found that with WGT. His strategy was to set goals for himself, saying that after starting to play WGT he wanted to reach Legend tier. After that, he "wanted more" and after 5+ years he has reached Champion tier, accomplishing many other milestones along the way including contributing almost 340,000 XP to his country club. When asked what tips or advice he would give to new WGT players, he says to "be patient and do not give up." He also noted that the "WGT community was a surprise for me," and that he has made some "very nice" friends on WGT – "too many to mention... All of those that may see this thread and remember me, I know they will smile." 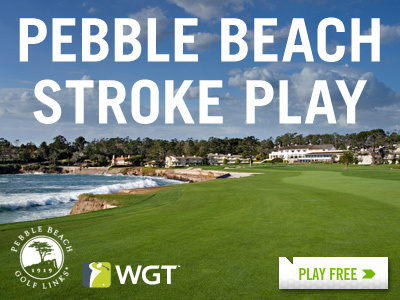 The wait is over... Pebble Beach stroke play is available now on WGT! This new stroke play course is one of the most anticipated to join the list of famous courses you can play free on WGT. 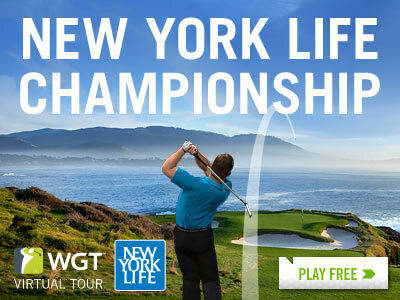 Compete this month in the WGT Virtual Tour Major tournament, the New York Life Championship, for a double purse of 400,000 WGT Credits. Play new Ready-Go's on Pebble Beach for a fast, fun way to compete for WGT Credits. These paid tournaments are limited to the first 50 players that enter, and the top 30 players earn credits. And for top WGT players, try a High-Stakes Ready-Go tournament with a higher entry fee, but a larger payout as well! WGT Brackets are another fun way to compete against other players on the new Pebble Beach course. Brackets are multi-round tournaments where you compete against other players head-to-head, with winners advancing to the next round until a final champion is decided. Choose to play either free or paid Brackets to win WGT Credits. *Note, this new stroke play course is just the Front 9 of Pebble Beach because we were just too excited to keep you waiting any longer! We're working on the Back 9 now and will get it out as soon as possible. 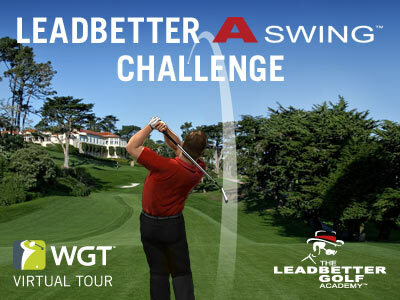 Congratulations to Champion tier Tordodam on winning the Leadbetter A Swing Challenge in November, the second tournament in the Oct-Dec 2015 WGT Virtual Tour Quarterly Season. With an impressive stroke play final score of 107, Tordodam edges fmagnets (109) for the top spot on the Champion tier leaderboard, followed by MarioSilva with 110. Congratulations to all the leaderboard winners in the November tournament, and we are currently contacting players to award the sweepstakes prizes, including online coaching with David Leadbetter, one free month in the Leadbetter A-Swing Online Training Team and A-Swing Complete Training Kits. We'll announce these winners soon, once they're confirmed! The final Major tournament of the 2015 WGT Virtual Tour is being played on the newest stroke play course on WGT... PEBBLE BEACH. This highly anticipated course is available now so you can experience full Pebble Beach stroke play for the first time on WGT. Compete in the New York Life Championship in December and play as many times as you want in the unlimited play first round, now through 12/25. Then compete in the two single-play final rounds (12/26-12/28 and 12/29-12/31) for the huge 400,000 WGT Credit purse. *Note, this is new course is the full Front 9 of Pebble Beach because we were too excited to keep you waiting any longer! We're working on the Back 9 now and will get it out as soon as possible.